Dan Gulizio was the guest speaker at a recent meeting of the Greater Huntington Civic Group. Mr. Gulizio is a resident of Huntington and has worked as a professional planner on Long Island for nearly 25 years. During this time he has served as the Commissioner for the Department of Planning and Development for the town of Islip as well as the Commissioner of the Department of Planning Environment and Land Management for the town of Brookhaven. In addition, he has served as Deputy Director of Planning for both Nassau and Suffolk counties. He is currently the executive director of the community planning center whose mission is to protect, restore and enhance the quality of life with the partnership of the public for present and future generations. He holds a Masters Degree in Urban and regional planning from Columbia University. He is also a graduate of St. John’s University School of Law. He is a member of the American Planning Association, The American Institute of Certified Planners and the New York State Bar Association. 1. What government’s fundamental responsibilities are. 2. How government is performing those responsibilities. 3. Why they are doing such a poor job of handling those responsibilities. 4. How we move forward and how we can improve upon this process. “In terms of air quality, there are 62 counties in NY State. Suffolk county has the worst ozone pollution out of all the 62 counties in the entire state, stated Mr. Gulizio. He continued, “according to reports from the American Lung Association, for 13 years in a row, Suffolk County has received a grade of F based on its ozone pollution in a study conducted by the Lung Association. There are a variety of reasons for this. One of the main reasons is the number of people living here. 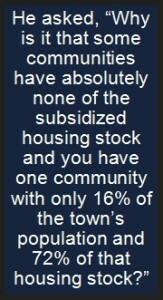 There are 1.5 million people living in Suffolk County and another 1.5 people living in Nassau County. This causes a great deal of pollution especially from the number of cars. 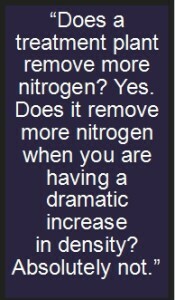 “One of the biggest health contaminents that the department of health screens for is Nitrogen,” said Mr. Gulizio. “The health department has established standards for articles 6 and 7 under the sanitary code to protect us from too much nitrogen going into our ground water. If we have more than 10 milligrams per liter of nitrogen we get sick.” The standard to keep the rivers, bays and estuaries is much more stringent then the ones that are supposed to keep us healthy. “Instead of no more than 10 milligrams per liter to keep us healthy, it is 1 milligram per liter to keep them healthy,” said Gulizio. “According to the study, Nitrogen has increased in the Upper Glacial aquifer by 38%. In the next layer or Magothy Aquifer, it has increased by 200%,” said Gulizio. Gulizio explained that over-development has not only hurt our drinking water, it has adversely impacted our bays and streams. “In 1976, approximately 700,000 bushels of clams were harvested from the Great South Bay. In 2009, the number was 7000 bushels. There has been a 99% decline in the clam population in the Great South Bay,” he said. “In the 197 0’s and 80’s the scallop population in the Peconic Estuary was one of the most naturally bountiful harvests in the county. Harvesters would typically remove between 400,000 and 500,000 pounds of scallops annually from the Peconic Estuary. 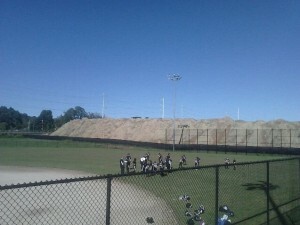 It is now about 20,000 pounds,” said Gulizio. 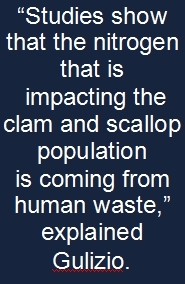 “Studies show that the nitrogen that is impacting the clam and scallop population is coming from human waste,” explained Gulizio. “In addition to the significant impact on the clam and scallop population, the lobster harvest has also been significantly impacted,” he said. “The Long Island sound used to have one of the most bountiful lobster harvests. In 1998, there was 3.7 million pounds of lobsters removed from the Long Island Sound annually. In 2011, there was 124,000 pounds of lobster harvested which is a 98% decline,” explained Gulizio. “Water Quality experts will say as long as nitrogen is below 10 milligrams per liter or as long as the volatile organic compounds related to petroleum below the surface level stay below a certain level, and as long as certain pharmaceuticals are below a certain level, it’s ok. When asked the question what about a cocktail chemical sitting in our groundwater, what about that, did anybody study that? The answer is no. They can’t tell you what happens when you combine all of these elements,” stated Gulizio. “The Comprehensive Water Resources Management Plan Study detected more than 80 pesticide related compounds in our drinking water,” he added. “We have more than 10,000 acres of shellfish beds that are closed on an annual basis because of toxins,” said Gulizio. 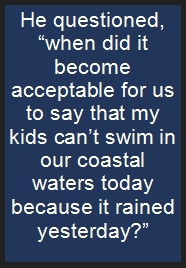 “When it rains, it washes all of those toxins and pollutants into our waters and we can get sick if we swim,” he explained. He continued, “What’s next? Don’t go outside today because the ozone pollution is so bad?” He continued, “well that’s starting to happen too. We get ozone advisory days where the elderly and sick are advised not to go outside. This is unacceptable and it doesn’t happen by accident. The reason this is happening is because we have poor regulation, poor planning and our development patterns are starting to come home to roost right now,” said Gulizio. “The Comprehensive Water Resources Management Study looked at the sewage treatment plants that were operating between 2003 – 2006. There were about 154 operating at that time. During that time period, 79% of those treatment plants failed to meet drinking water standards,” stated Gulizio. “If you build in hubs and then preserve open space on another parcel then you are preventing sprawl.” According to Mr. Gulizio, of the 199 treatment plants, not one prevented sprawl and all led to higher density. You will hear people say, we need more multi-family housing because young people are leaving. They will say that multi-family housing generates fewer school aged children than single family homes. They will say that multi-family units are tax positive. If you base it on this study, there will be a 50% increase in the number of school aged children that will live in Avalon Bay compared to what would have been generated from the existing zoning,” Gulizio said. “Once you get past the density of about 3.5 units per acre, you are generating more school aged children than a single family dwelling,” explained Gulizio. As a result of not getting as much money as they were supposedly promised, the builder said they are going to have to shrink the size of the development from 6 stories to 5 stories but they wanted to keep the same number of units. So they asked Riverhead officials to decrease the minimum square footage that the builder has to comply with. They lowered the size to 360 square feet from about 900 square feet for some of the units. After all of the accommodations, the town gave the builder a 10 year 100% tax abatement and they also waved the sales tax for their construction materials. These enormous developments with all kinds of tax abatements and tax payer subsidies are precedent setting, explained Gulizio. “This is a trend and it continues. If you look at population density over time in suffolk county, it has not only increased but it is also moving East. This is causing the Island to become more and more dense,” said Gulizio. The whole purpose of zoning is to decide whether and how you ought to use land. The idea is to make sure there is a rational balance in the amount of residential development, the amount of commercial development, and the amount of industrial development that you need in order to accommodate that tax base in order to maintain government services and educational services, he explained. Gulizio continued, what has happened over the years after decades of influence of special interest and a lack of participation from the public is that the balance has gotten out of whack. We don’t have the right balance in many communities between residential, commercial and industrial. We don’t have the right jobs being generated. We have a surplus of shopping center development. We are seeing the number of abandoned shopping centers going up. We are also hurting our downtowns by building shopping centers outside of our downtowns, he explained. Gulizio explained that there is a discrepancy regarding equal protection. “There are very different approaches to different communities,” he explained. “Huntington Station has 16% of the town’s population, it also has 40% of the town’s minority population. It has 72% of the non senior subsidized housing stock,” explained Gulizio. According to Gulizio, Huntington has an average density of about 2.1 units per acre. The average multi-family housing density in the town is 5.1 units per acre which is 140% higher than the town wide average. The multifamily housing in Huntington station is 9.5 units per acre, almost double. As it stands now, it is an 86% increase from the town wide average. To accommodate Avalon Bay, they approved 14.2 units per acre, which is 178% higher than the town wide average. Gulizio explained, one of the disingenuous arguments made by the Avalon Bay proponents was that this is a perfect location because it is in close proximity of the train station. The typical walking distance to get to a train station is less than ½ mile, according to Gulizio. “The Long Island index recently did a study including all the areas of Long Island that are within ½ mile of the train station. The Avalon Bay parcel was not included in that study because it is not within a ½ mile of the train station,” said Gulizio. If you are walking from the eastern portion of the property it is over 1 mile to the train station,” Huntington Station resident Matt Harris said. 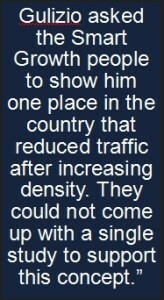 “From the closest point it is 6/10th of a mile plus you have to walk from where you live in within the complex,” he added. Avalon Bay will be 40% more dense than Highview which is 10 units per acre. The town of Huntington went against their own plan that said that the subsidized housing should be fairly distributed throughout the town. “If you have a community that already has 72% of the subsidized housing stock, why is that an ok location for even more?,” he asked. “It doesn’t make sense from a planning stand point and it is not logical from a philosophical stand point,” said Gulizio. How did we get here and can we recover? Many people feel we have reached the point of no return in terms of Over Development and destroying Long Island’s natural resources. Mr. Gulizio is not one of them. He is still optimistic that we can reverse what has been going on. 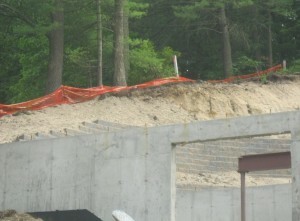 One example he provided about special interest was from the Long Island Builders institute. This year they lobbied for several new rules. They wanted to modify SEQRA regulations. They also wanted to pass regulation where if you want to sue a builder, you would be required to post a bond, in the event that you lost, that bond would go to the developer to defray the cost of the delay to the developer. They also wanted to spur the development of additional multifamily housing and to find a subsidy to finance the infrastructure that’s needed to accommodate the additional multifamily housing. He urges resident to show up at meetings, and make calls to elected officials. He continued, “It can’t be the same faces of people that show up at every meeting. The key is to get a small percentage of the population to show up. We need to get 2% of the population to go to 2 meetings per year.” He believes that would be enough to make an impact. He explained the best way to clean ourselves of this is by having town officials start doing what they said they would do according to their Horizons 2020 plan. “The town needs to adopt rational standards for the distribution and density of housing.” Gulizio continued, “when you do that, then you have a rational basis for your actions providing you act according to your plans. When you don’t do that, you leave the town and all the residents vulnerable to lawsuits and at the whim of the builders. Which is what has been going on in Huntington,” he explained. “If you say you are going to use the plan, and you continue to only impact one or two communities then you are going to have problems,” he explained. “It’s not just apathy that keeps people from getting involved. The fact is that most people haven’t been trained in this to be part of this process,” stated Gulizio. That is something Gulizio would like to help change.